The day before Chanukah, a great light was extinguished from the world. 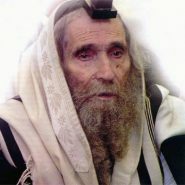 Gadol Hador Rabbi Steinman zt”l was accompanied by 200,000 Jews to his final resting place–and at the funeral, his final will was read. In his will, he made some unusual requests: following his death there should be no articles written about him or announcements of the funeral or eulogies given before the burial–enough that there should be 10 men to accompany his body. No praises written on his gravestone (the cheapest available, please), just his name and his father’s name. Don’t bury him in the rabbinic section of the cemetery, rather bury him among regular people. Interesting, right? For the men, he requests that, for the elevation of his soul, they should learn a single chapter of mishna over the course of the year. And from the women, he requests 10 chapters of Psalms every day for a year. That’s how deeply Rabbi Steinman believed in the power and impact of a Jewish woman’s prayers. Wow, I heard it but I didn’t HEAR. How true! Incredible insight. As an aside: the day after an entire supplement to a religious magazine came out about the rav, with the Rav on the cover. I simply don’t understand it, the magazine has a rabbinical council, no less. How could they allow it? As much as I would love to read about him, I couldn’t because I didn’t think it was right as it went against his express wishes. Even if it was already published and packed they could have stopped it, at least the copies in Israel.